[Wild Card]This title is a translation sourced from Granblue Fantasy. A teenager who was forced to move from his hometown after an influential public figure accused him of a crime he didn't commit. 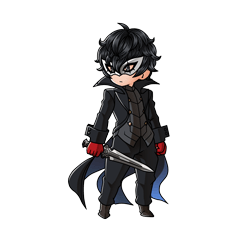 On the surface he appears to be a common high schooler, but below that is the leader of the Phantom Thieves of Hearts. Blessed with the power to utilize a multitude of Personas, it's fitting that this Wild Card is also the ace in the hole for the Phantom Thieves. All-Out Attack Massive Dark damage to a foe (Boost to C.A. DMG based on how low foe's HP is). ⇧ Lvl 55This skill is enhanced at level 55. 400% Dark damage to a foe (Damage cap: ~440,000). Duration: 3 turns on a foe. Boost to critical hit rate against a foe in Overdrive60%~70% chance of dealing 30% more damage. When the foe's HP equals 100%, the damage multiplier equals 450%. This damage increases up to 100% at 1% HP. The effect of All-Out Attack depends on which character appears during the charge attack animation. 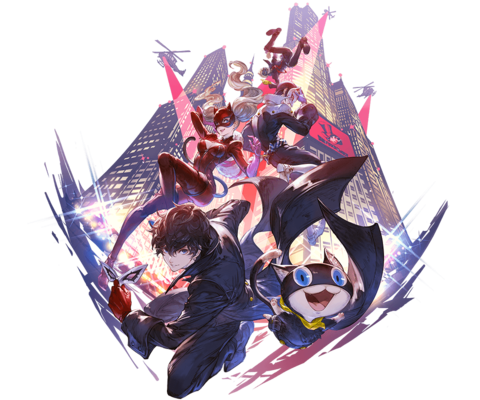 Mona Dia Restore 30% of Joker's HP (Healing cap: 1500). ), they will not stack. plus other special debuffs will be applied. is applied, there is an approximate 50% to 60% chance for both normal attacks and special attacks to miss. Normal attacks are rolled per hit; it is possible for a triple attack to miss 2 times and hit 1 time. Special attacks are rolled in its entirety; either everything hits or everything misses. Plain damage will always hit. Local status effect have an equal chance to be inflicted. The reuse of Eiha does not carry over to the next turn. 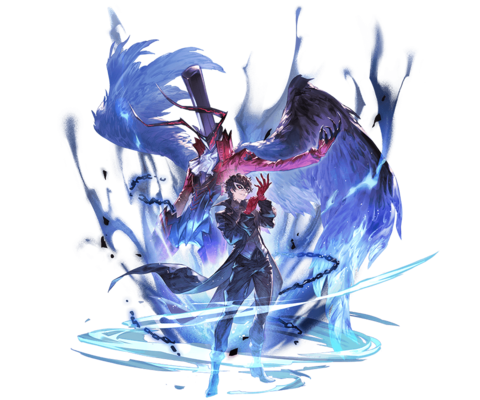 If the skill is not used, the cooldown will be set to 6 turns (Lvl 55: 5 turns) on the next turn resulting in a 1-turn loss of cooldown time. This page was last modified on 11 December 2018, at 08:07.